You may not be able to teach an old dog new tricks, but you can certainly do so with a series about transforming robots and an intergalactic battle against fascism—as long as you put the right people in charge. That’s what eight briskly-released seasons of Netflix’s Voltron: Legendary Defender taught animation fans with its relentlessly fresh take, which always felt more like a lively reincarnation than a defibrillated cash-grab. Showrunners Lauren Montgomery and Joaquim Dos Santos, known for their work on two of the most beloved shows in modern animation—Avatar: The Last Airbender and its follow-up, The Legend of Korra—brought along writers from the two series (Tim Hedrick, Joshua Hamilton, and May Chan) to saturate Voltron in empathy and imagination from script to screen. A plethora of ridiculous-sounding sci-fi terms supplement classic, space battle-y A-plot conflicts, while the show’s true complexities lie in its interpersonal relationships. Like the best episodes of the various iterations of Star Trek, Voltron takes a diverse and engaging crew (voiced by Steven Yeun, Josh Keaton, Jeremy Shada, Bex Taylor-Klaus, Tyler Labine, Rhys Darby, and Kimberly Brooks), sticks them with an intergalactic conflict, and imbues each episode’s delicious pulp with political subtext and personal relevance. Whether the Paladins are fighting a giant space worm/manta-ray thing that exudes angler fish-like optical illusions in order to lure in its prey, competing on an alien game show, or navigating a white hole, every set piece and fantastical logline always resolves thanks to the personal development of a character. The serialized space wandering of Trek always benefited from casually progressive characterization, and Voltron implements the same approach, albeit for a younger audience. It’s not afraid to be goofy; for every reckoning with weakness a hero has, the show will earnestly sell some groaners or sit back and bask in an awesome piece of alien creature design. Voltron can even get, at its weirder moments, to some Rick and Morty or The Venture Bros.-level meta storytelling (a narrative gamble only possible after earning an audience’s trust over many, many seasons). All of this adds up to some great mecha anime. With such a thoughtful creative team assembling this Voltron of televisual ideals, the metaphor of giant transforming robots with relatively powerless pilots—in which the potential dormant inside even the meekest soul is unlockable through teamwork—has never found a more empathetic home than that of Voltron: Legendary Defender. And those that ushered it in had already successfully executed a genre-based, faction-filled, emotionally honest story of warfare and chosen ones, of black-and-white morals that quickly complicated, and of beautiful anime-inspired art. The strengths of Avatar and Korra translated perfectly to space, with similar allegories of destructive military industry and endless imperialism fitting snugly into the new surroundings with just a slight change in jargon. Situating them into an existing property wasn’t just a case of doing the best with what you were given, but rather finding the potential hidden in something whose brand identity has been eclipsed and tarnished by that other transforming robot franchise. That makes Voltron a great show and a great reboot. Some of that comes from the content (incredible battles between animalistic robots flying through asteroid fields!) or the approach to said content (a wide range of skin tones and sexualities among its leads), while some comes from the absurdly impressive production itself. The ludicrous number of factions and the actual hundreds of characters make Voltron a cartoon with depth beyond all but the most complicated and long-running anime—all from a two-and-a-half-year run. That’s right, all eight seasons of the serie—spanning almost eighty episodes—came out between June 2016 and this month. Prolific efficiency is usually spread between 1% formal masters (Stephen King) and 99% corner-cutting template-followers (everyone else), so seeing Voltron maintain its excellence through to its existential and powerful final episode, “The End is the Beginning,” is an unexpected satisfaction mirrored by one of the year’s best movies, Spider-Man: Into the Spider-Verse, and one of the year’s best TV finales, the end of the influential Adventure Time. 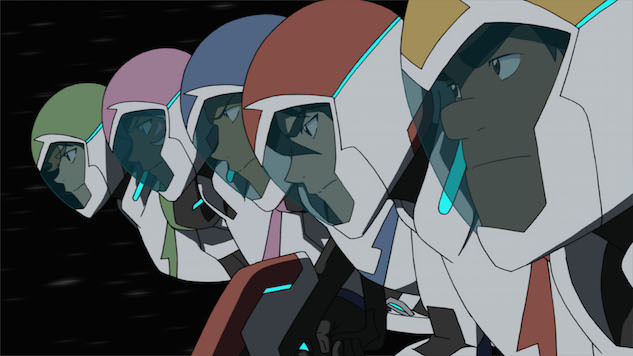 Consequences from early in the run come back to bite the maturing heroes at their centers, giving Voltron a conclusion steeped in the relationships and personal arcs of its initially simple heroes. Much like Finn eventually deconstructed what it meant to be a boy-warrior, the Paladins deconstruct the responsibility inherent in being a guardian of Earth. The side characters they brushed, bumped, and battled throughout the previous seven seasons fuel the final season’s antagonism, which furthers a precedent set by Avatar: The best way to get an audience hooked is by persuasively motivating both sides of a conflict. As Voltron’s heroes deal with the lives they damaged while fighting for their cause, the series trains viewers to care about every one of those hundreds of aliens, pilots, and villains— because they just might turn up again. By introducing accountability to a genre that so often blows up planets, stomps around cities, and flies off proudly into the final frontier, Voltron tells us that it’s OK to be invested in a kid’s show because the characters in the kid’s show are written to be as invested in their friends, their homes, and their causes as the people behind them. One of the final season’s more formally adventurous episodes, “Day Forty-Seven,” uses a first-person home documentary style inside of the animation to bring us into the mind of a minor character while telling a narrative filled with the same ideals. Lieutenant Ryan Kinkade, an introspective fighter pilot on the fringes of the main story, shoots video of himself going about his day. The camera is eventually abandoned as the crew fights a massive beast, rolling around thanks to different people and animals giving the viewer multiple side perspectives on something (a big space battle against some bonkers creature) that’s been the plot of the show before, but through eyes that—in any other show—wouldn’t be allowed to see. Instead of background filler, these characters have enough personality that when they take over the camera, the entire filmmaking style is altered along with the subject they prioritize. When, at the end of the episode, a B-plot about successfully baking a specific alien diaspora’s dessert in order to build trust becomes the most narratively impactful moment in the episode, the dots elegantly connect: Empathy is Voltron’s quintessence, its driving fuel and its prime directive. And now that it’s over, those moving on can list the series alongside Korra and Avatar as one of the most impressive of its time. The final season of Voltron: Legendary Defender is now streaming on Netflix.